Complete details of these and all tour dates appear at the bottom of this newsletter and continually update at http://annefeeney.com/calendar.html -- I do my level best to keep this accurate but it's always a good idea to check with the venue to confirm time, etc. Thanks for signing up for my email list. You should be getting one email a month from me, unless you change your mind. I really appreciate your interest in my music and my work. Please drop me a line when you get this and let me know what you think of the news... and be sure to send me information you think my list might be interested in! If this newsletter is disjointed it's because I've been camping in the rain for a week, but I hope you'll make time to read it, there's lots of important news this month..
On Wednesday Chris Chandler does a concert at the beautifully renovated Threadgill Theater. I'll be doing a guest number, as will Adam & Kris, Oliver Steck and Stephanie Corby ... but the real star of the show will be David Morreale, Chris' wonderfullly talented new East Coast partner... this new show sizzles, and if you get a chance to catch Chris on the road ... do it!! My new song "Recordaremos Santiago Cruz" will be available for download as soon as Jack Erdie sends me the mp3... (hint hint jack) The words and the story are posted on my ( http://fellow-travelers-advisory.blogspot.com/2007/05/song-for-santiago-cruz.html) blog. And I just put a new jukebox up on my (http://myspace.com/annefeeneyreally) myspace page, on my (http://annefeeney.com/news.html) news page, and on my blog so downloading one song (or several) is easier than ever. Just before coming to Kerrville I was minister-of-culture/faculty at the Regina Polk Institute for Union Women... it's a fantastic annual conference for union women from Wisconsin, Illinois, Iowa and thereabouts... This year's collective bargaining role play was negotiating a contract for migrant workers in North Carolina with the Growers' Association. Leticia Zavala from the Farm Labor Organizing Committee was our most informative advisor on this project and really opened our eyes to the serious problems of migrant workers in the US and the difficulty entailed in their struggle for dignity. Just before the conference began we learned of the murder of Santiago Cruz, a 29 year old FLOC organizer. Santiago was staffing the FLOC office in Monterrey, Mexico. The FLOC office there is facilitating the process of obtaining H2A visas ... workers getting visas through the office need not deal with smugglers and coyotes ... spending $2-5000 to get across the border. There were many unethical and corrupt people whose greedy livelihoods were challenged by FLOC's office. 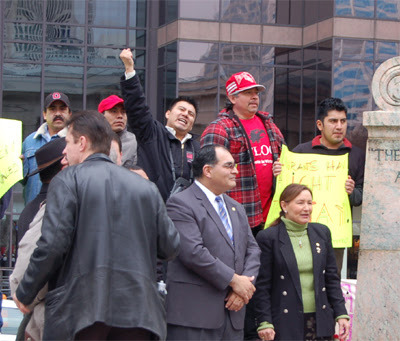 Santiago Cruz's murder was meant to deter the quest for justice in the fields. check the information in the tourdates section below... scholarships may still be available for those who qualify. don't pass up this great educational opportunity. These summer schools make you better union members, citizens and community members. COME TO IRELAND WITH ME!!! Lots of you wrote to comment on my Irish tour blog... many of you said you wished you could have come along... well, guess what? YOU CAN!! It looks like it would most likely be a nine day tour and cost approximately US $1750 + transportation to Shannon... This includes all ground transportation and accommodations and several meals, as well admission to as a series of terrific cultural events featuring Irish poets and musicians. If you'd like to know more about a tour like this... email me right away to express interest and I'll keep you informed as plans develop. PLEASE help me fill in these empty dates!! If you would like to host a house concert I'll show you how... If you know of an event (banquet, rally, riot, conference) in progress on any of these dates, please let me know!! June 30th off near tacoma, olympia - help!! Saturday July 7- Astoria, Goble, Corvallis, Bend??? I'll seriously consider almost anywhere in Oregon for these dates... Let me know if you can help..
ALSO, Labor Day is still open for me... If you'd like me to sing at you Labor Day 2007 event, drop me a line! They're also running a pool right now.... correctly guess the hour, minute and day that Alberto Gonzales steps down and win a few gallons of Ben & Jerry's Ice Cream ... Yummm! Write me with your ideas..
Baltimore United for Peace and Justice wants to raise enough money to send several people to the national assembly of United for Peace and Justice in Chicago June 22-24th. Give more if you can, less if you can't. •Find your Voice •Become Inspired • Work for Change •Learn by Doing •Connect with Great Women •Have Fun! Plan now! • Cost: $500 including room and meals, - $425 if you need to pay for childcare while you are away at the school, - $400 for Commuters (meals only). • Have your Local/International and Labor Council budget for scholarships now. • Talk to your sisters about attending. • Limited number of scholarships available. Attend the 26th Annual Summer Institute for Union Women for a week of learning, celebration, inspiration, and action. We welcome all women engaged in action to improve the conditions of working people. The Institute celebrates the solidarity of union and community-based women activists, and crosses the boundaries of age, race, occupation, and nation. There will be classes and activities for women activists at every level of experience, from beginner to advanced. All classes will be presented in a supportive environment to enable the sharing of ideas, strategies, information, and experiences. Instructors are energetic and highly respected labor educators who understand the importance of providing a hands-on, dynamic educational experience. In addition to classes, there will be cultural events, solidarity actions, free time to sightsee, and exciting keynote speakers and plenary sessions. Scholarship application deadline is June 15th! ¿Que cobarde apogò su luz? The story behind this song appears in both English and Spanish with pictures of Santiago here. ACTIVELY BOOKING CA, OR, WA, BC in June/July!! Find a hole in the tour dates below and invite me to play!!! Do you live near any of these places? I hope to see you at one of these upcoming shows! check out http://annefeeney.com/calendar.html for continuously updating tour dates. Do you know anyone who lives near any of these places? PLEASE spread the word. This is a word-of-mouth 'career' I have... I count on you to let folks know I'm performing in their hometowns! I'm very excited about the Darlington, MD Susquehanna Music and Arts Festival... It's a camping-optional festival located halfway between Baltimore and Philadelphia at the charming Ramblewood Resort. This year's lineup is fantastic! And if you have friends in Chicago, please send them to the People's Church for my May 19th concert. This is the same wonderful room where we had the 100th anniversary of the IWW concert a few years ago with Utah Phillips, Charlie King, Len Wallace, Mark Ross, Rebel Voices, Citizens' Band, Mark Ross -- what a night!! Your interest in my music and your support makes my so-called career possible. Please forward it widely! I try very hard to keep my tourdates current and accurate. It's always a good idea to check with the venue, though. Most of my music is available for digital download at Itunes and dozens of other digital music outlets. Labor's History says, "Don't give our day away!" "Stick Labor Day up your (somewher appropriate)!" And ain't it great to celebrate on the glorious first of May! May Day. A day to herald the coming of Spring with song and dance, a day for children with flowers in their hair to skip around beribboned maypoles, a time to crown May Day queens. hours for what we will!" The changing economy has forced many workers in recent years to regularly exceed the eight-hour workday that their predecessors won. But eight hours for work nevertheless remains the standard in the United States and every other industrial nation and at least an aspiration in others. Winning the eight-hour workday took years of hard struggle, beginning in the mid-1800s. By 1867, the federal government, six states and several cities had passed laws limiting their employees' hours to eight per day. The laws were not effectively enforced and in some cases were overturned by courts, but they set an important precedent that finally led to a powerful popular movement. The movement was launched in 1886 by the Federation of Organized Trades and Labor Unions, then one of the country's major labor organizations. The federation called for workers to negotiate with their employers for an eight-hour workday and, if that failed, to strike on May 1 in support of the demand. Some negotiated, some marched and otherwise demonstrated. More than 300,000 struck. And all won strong support, in dozens of cities -- Chicago, New York, Baltimore, Boston, Milwaukee, St. Louis, San Francisco, Pittsburgh, Denver , Indianapolis, Cincinnati, Detroit, Washington, Newark, Brooklyn, St. Paul and others. More than 30,000 workers had won the eight-hour day by April. On May Day, another 350,000 workers walked off their jobs at nearly 12,000 establishments, more than 185,000 of them eventually winning their demand. Most of the others won at least some reduction in working hours that had ranged up to 16 a day. "Hurray for Shorter Time," declared a headline in the New York Sun over a story describing a torchlight procession of 25,000 workers that highlighted the eight-hour-day activities in New York. Never before had the city experienced so large a demonstration. Not all newspapers were as supportive, however. The strikes and demonstrations, one paper complained, amounted to "communism, lurid and rampant." The eight-hour day, another said, would encourage "loafing and gambling, rioting, debauchery, and drunkenness." The greatest opposition came in response to the demonstrations led by anarchist and socialist groups in Chicago, the heart of the eight-hour day movement. Four demonstrators were killed and more than 200 wounded by police who waded into their ranks, but what the demonstrators opponents seized on were the events two days later at a protest rally in Haymarket Square. A bomb was thrown into the ranks of the police who had surrounded the square, killing seven and wounding 59. The bomb thrower was never discovered, but eight labor, socialist and anarchist leaders  branded as violent, dangerous radicals by press and police alike -- were arrested on the clearly trumped up charge that they had conspired to commit murder. Four of them were hanged, one committed suicide while in jail, and three were pardoned six years later by Illinois Gov. John Peter Altgeld. Employers responded to the so-called Haymarket Riot by mounting a counter-offensive that seriously eroded the eight-hour day movement's gains. But the movement was an extremely effective organizing tool for the country's unions, and in 1890 President Samuel Gompers of the American Federation of Labor was able to call for "an International Labor Day" in favor of the eight-hour workday. Similar proclamations were made by socialist and union leaders in other nations where, to this day, May Day is celebrated as Labor Day. Workers in the United States and 13 other countries demonstrated on that May Day of 1890 -- including 30,000 of them in Chicago. The New York World hailed it as "Labor's Emancipation Day." It was. For it marked the start of an irreversible drive that finally established the eight-hour day as the standard for millions of working people. Read the full article at the link below, or the excerpt included here, and then send me your most creative idea for retaliating against this mean-spirited greed machine. Refusing to patronize Circuit City somehow doesn't seem to be punishment enough. The three or five most creative ideas will be published in next month's Fellow Travelers' Advisory, and the person submitting the best idea will win an appropriate prize. The company said the dismissals had nothing to do with performance but were part of a larger effort to improve the bottom line. The firings represent about 9 percent of the company's in-store workforce of 40,000. The company gave the dismissed workers severance pay and told them that after 10 weeks they were free to apply for any openings. Employees reached by a reporter said they were notified yesterday morning and told to leave immediately. The firings, along with several other moves, are expected to reduce expenses for the electronics retailer by $110 million in fiscal year 2008 and $140 million a year starting in fiscal 2009. Circuit City said sales would be volatile for the next several months as the company adjusts to the changes. "It's definitely going to have some cost-savings, but I think the bigger impact could be seen in weaker, poor service," said Timothy Allen, an analyst with Jefferies & Co. "I have a feeling the people they're letting go have probably been there longer, have more experience, more product knowledge." Circuit City chief executive Philip J. Schoonover received a salary of $716,346, along with a $704,700 bonus last year. He also has long-term compensation of $3 million in stock awards and $340,000 in underlying options, according to company filings. My visit to Champaign/Urbana was a total blast... thanks to the very hard work and creative ideas of Dave Johnson and the music of the amazing "Orn'ry Duffers" - the kickass backup band assembled by the wonderful Paul Kotheimer ... It was so much fun to perform with a band!!! But the most touching moment of the day was when Deneen Sigler of the striking Conn-Selmer workers took the stage. 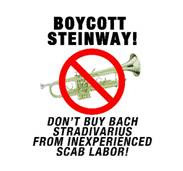 230 union musician instrument makers at the Conn-Selmer Vincent Bach plant in Elkhart, Indiana have been on strike since April of 2006. This is the longest ongoing strike in the United States. The company which owns this plant, Steinway Musical Inc was taken over by Dana Messina and other speculators who got their "training" under stock manipulator Michael Milken. They have sought to destroy the health care and pension rights of the workers and drive out those workers who were over 50 years of age. In an effort to break the strike, 120 scabs have been brought into the plant and management has obtained injunctions severely limiting picketing by striking workers. An injury to one is still an injury to all! A year after their fabulous victory with Taco Bell, the Coalition of Immokalee Workers managed to sign McDonald's on to the Fair Food Campaign. McDonald's will pay an extra penny a pound to the workers who pick their tomatoes, and will be involved in a campaign to improve living and working conditions for tomato pickers. YES!!! Now, on to BURGER KING!! BERKELEY, Calif. Bye-bye bottled water. Hello tap. Chez Panisse (shay puh-'NEES) in Berkeley is among several upscale Bay Area restaurants that are ditching bottled water in the name of conservation.The bottled water backlash is being spurred by environmental concerns over the energy used in transportation as well as the disposal of all those containers.Chez Panisse stopped serving bottled non-sparkling water last year and expects to stop serving bottled carbonated water in a few weeks. and on May 6, my cousin Bill Feeney celebrates 35 years as a Catholic priest! and bring a tax-deductible check to support People's Church - your voice for social justice in Chicago! this camping festival lasts 18 days. It's mecca for songwriters and a great reunion for us road warriors and veterans of this 36 year old festival.